Be That SOMEBODY | SnL World !!! I wait for the signal to turn red , only place I feel self conscious. While the vehicle and their owners wait like hungry, impatient hawks for the signal to change I walk hurriedly to escape from their intense stare . As I continued walking the same lane, with same name boards and houses I saw a bundle of red sari near the parked Car on near by shady footpath. With Option of finding a dead body anywhere any time I got startled , early morning I didnt wanted to faint seeing a dead body not today not any other day. So to make it sure its not dead body I stared at the bundle and peeked to get a clear picture with my four eyes. Its then I saw the head, legs and then whole body. It took almost 5 minutes to realized its a woman clad in red sari and to my happiness she was breathing, ALIVE!!. If it was not the for the road I would have jumped with joy, Imagine you are scared to death to find a dead body wrapped in cloth to stain your memory rest of your life and suddenly the body moves and you are relived from the curse. She was new to the place I knew it. I walked away without giving a second thought. The day went with its own timetable which is to “just Role”. Evening When I was walking through the same road I spotted the same lady seated now on the same spot. I just wondered whether she had any food whole day. Weak she looked in her current condition. I felt sorry for her,”None of my business, somebody else will help” thought; like rest of the people; I walked with my eyes closed. Next day morning I saw her again, I still followed the same “ None of my business, somebody else will help” thought, I ignored and walked. That day evening when I was walking back from office at 7.30 PM something burned my heart. When most of the people were rushing to catch a bus to reach home as soon as possible there she sat in that same spot in the dark. With my head filled with her thoughts I walked home. Life I tell you is mean bit&* anytime it takes a turn without giving prior notice. I handed my written letter to Miss Pushpa to complete formality. She assured me that they will look after her. When Pushpa pointed at me and said “She’s the one who called us” Susheela folded her hands in gratitude I just smiled feeling happy. 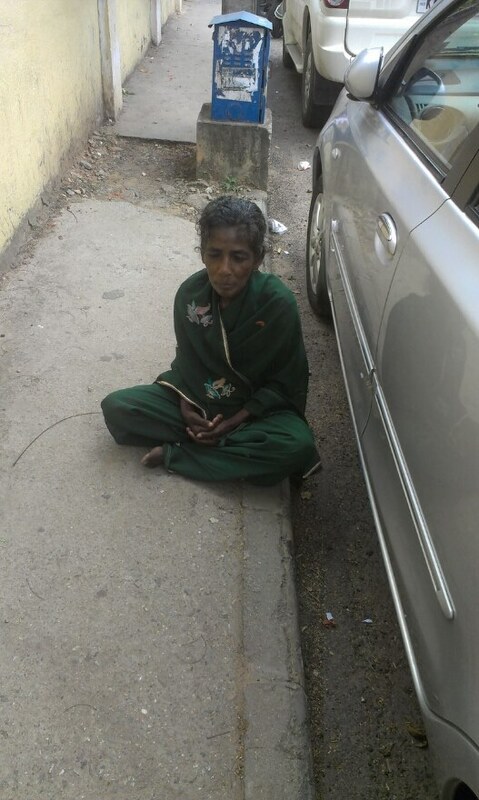 In span of 2 hours without spending a penny, merely conversing over the phone, for the first time I was finding a shelter for a stranger, I was finding a bed for a woman who slept on footpath. Next time you see someone dont stay kilometers away and say “its none of my business, somebody else will help her” instead make it your business and be the that somebody to help. People in need dont want your pity and sympathy they need you and your help. God bless you SNL for taking up the initiative to call up the NGO. You thought the right direction and thought of Humanity, and blessed someone with Shelter. I wouldn’t have thought of calling up, but the first instance would give her some money for food. But what you did made me realise that just by giving them money wouldn’t solve their problems which we never bother to ask as they are strangers who don’t fall in line with us. May God shower his blessings on you and hoping people can always go an extra mile to help a needy.